In preparation for the session at IBC in September I have been doing some experimentation. Firstly, with the assistance of friends at the BBC Natural History Unit in Bristol, I got my hands on a full-frame Canon DSLR which had had its infrared blocking filter removed. Unfortunately the weather denied me the sunshine that really gives a punch to the Wood Effect but the Clifton Suspension Bridge is always impressive. 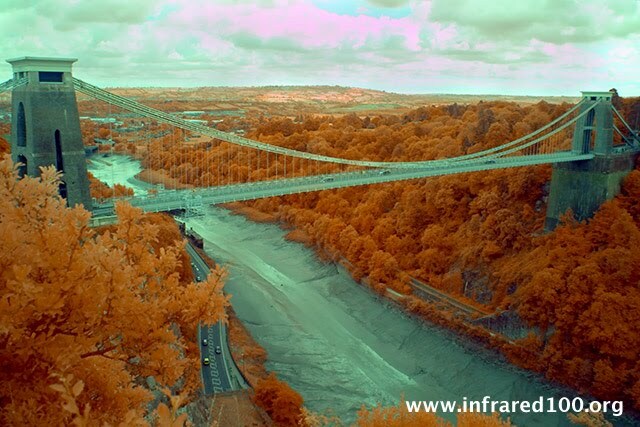 One thing I was keen to try was using a minus-blue filter (Wratten #12) to emulate Infrared Ektachrome. Despite the cloudy day the result was promising. You can see the first stab here. After some channel equalisation/normalisation this image uses the Photoshop channel mixer to map the camera's blue channel to red (only infrared should be getting through the #12 and the camera's blue filter), maps red to green and green to blue. Some blue (an arbitrary 50%) has been subtracted from both the green and blue output channels. This emulates the process used in Kodak's DCS 420, a version of which was a short-lived colour infrared DSLR from the mid-1990s. It looks as if this deserves further study. If you have a modified DSLR and a #12 filter you should give it a try. What I had forgotten is that the filtration in front of the sensor is actually part of the light path that focuses the lens. The light going through the filter is not parallel, it is converging to hit the sensor. So if you remove the filter (glass) you change the refractive index of that part of the light path and optically extend the lens. To shorten it again you either have to physically move the lens (difficult because you probably don't have much room between the back element and the sensor, even if you could move it) or you have to put back some glass with the same refractive properties as the filter you removed. You have probably removed more than one filter, bonded together. The camera we were looking at had a removable filter unit which contained a high-pass filter in the frequency domain (the infrared blocker) and a low-pass filter in the spatial domain (the anti-alias filter). Fortunately, for landscape work, aliasing is not too big a problem and some DSLR owners actually remove these to get more sharpness. The actual efficacy of this is a subject hotly debated on various web forums and I won't get into it here. Two air display videos for you: both a mixture of colour and thermal imaging courtesy of Flightglobal and FLIR Systems. First ... some display highlights. Note the thermal reflections on the Airbus fuselage and how the thermal imaging shows the hot exhaust gases clearly. Secondly, the American F-22 Raptor ultrafighter. This was briefly at Farnborough in 2008 but is at this year's show every day including the public days over the coming weekend. More info in this piece in the Register, but it's worth noting that this plane aims to be thermally stealthy by reducing its heat signature. It does this, apparently, by channeling heat into the fuel tanks. This isn't so much to avoid detection by people with thermal cameras but more to foil heat-seeking missile systems. Thermal stealth dates back to (at least) the second World War, with the German navy concocting a special paint for U-Boats to reduce their infrared visibility (apparently under the misconception that the British were using IR to detect subs whereas it was actually RADAR). It's interesting to see how this particular FLIR camera (Star SAFIRE HD) switches from colour to thermal. This is a multispectral unit including HD thermal imaging. Here's the data sheet. I just discovered a fascinating web site called Chromoscope, which blends results from a number of astronomical projects working at wavelengths right across the EM spectrum. Basically you move a slider and change the wavelength at which you are 'seeing' the universe. They added microwave data from the Planck space telescope today. Near infrared is 'represented' by Hydrogen-alpha data at about 656 nm (deep red really) and there is far infrared data from IRAS. The spectra are not continuous so as you move the slider you blend distinct data sets rather than moving continuously across wavelengths. Kudos to the University of Cardiff for supporting this open source data-visualisation project, which makes use of the Google Maps API for zooming and panning. News emerged over the past few days about hyperspectral imaging being used to confirm that Thomas Jefferson changed a key word in the US Declaration of Independence as he drafted it. It has been suspected for over 60 years that he originally referred to fellow subjects (of George III) but hastily over-wrote it to become fellow citizens. This is in a sentence detailing grievances against King George, although the sentence itself didn't reach the final draft. A Library of Congress researcher used hyperspectral imaging (imaging the document various times using different narrow bands of light and nearby radiation such as infrared) to investigate Jefferson's rough draft late last year. It is unclear why the news came out now, but it was just before Independence Day weekend. See this web page at the LOC which includes a link to multi-spectral image of the Declaration. I mention this because one of the things Professor Wood noted in his 1910 paper was the use of different bands of light (in his case specifically infrared, visible and ultraviolet) to investigate documents. Infrared especially has a long history of use for investigating both dubious documents (the euphemism for forgeries and tampering) but also helping archaeologists and art conservationists. As early as 1933 the British Museum was using infrared film to help read and decipher writing on millennia-old Egyptian documents and NASA are even now using infrared hyperspectral imaging to garner more from the famous Dead Sea Scrolls.